Management of massive irreparable rotator cuff tears can be a source of significant dilemma for the treating surgeon. This is especially true when dealing with patients with poor physiological reserves where options of tendon transfer, superior capsular repair or arthroplasty might be unsuitable. We report the five-year outcomes of 26 patients who underwent balloon interpositional arthoplasty for the management of massive irreparable rotator cuff tears. Fifty-four consecutive patients underwent balloon interpositional arthroplasty in our institution. Of these, 26 patients completed at least two postoperative functional outcome measures over a five-year period, which included the Visual Analogue Score (VAS), Oxford Shoulder Score (OSS) and the SF12 score. Outcome scores were obtained prospectively. The average age at implantation was 67 years old. Our result shows statistically significant improvement in pain up to five years post-implantation of the device (p = 0.012). Function measured by the OSS and SF12 (PCS) score showed improvement up to two years post-implantation (p = 0.006). Three of the 54 patients in our cohort went on to have arthroplasty surgery for their rotator cuff tears. None of the patients in our cohort suffered from any adverse reactions following implantation. Results from our study identify the spacer device as an option in the management of irreparable rotator cuff tears with statistical improvement in pain and function. It may also delay the need for arthoplasty surgery. Keywords: Balloon, Irreparable, Massive, Rotator cuff tear, Subacromial spacer, Shoulder. © 2019 Bakti et al. Injuries to the rotator cuff are a common presentation to the shoulder clinic and are thought to affect up to 54% of the population over the age of 60 [1Sher JS, Uribe JW, Posada A, Murphy BJ, Zlatkin MB. Abnormal findings on magnetic resonance images of asymptomatic shoulders. J Bone Joint Surg Am 1995; 77(1): 10-5. [http://dx.doi.org/10.2106/00004623-199501000-00002] [PMID: 7822 341] ]. Clinical symptoms of rotator cuff tears include pain, reduced range of motion and reduced strength in shoulder abduction or rotation. The dilemma arises when dealing with a potentially irreparable massive rotator cuff tear. The definition of massive rotator cuff tear is still a highly debated subject. Cofield defined massive rotator cuff tears as those whose antero-posterior dimension exceeding 5cm [2Neri BR, Chan KW, Kwon YW. Management of massive and irreparable rotator cuff tears. J Shoulder Elbow Surg 2009; 18(5): 808-18. [http://dx.doi.org/10.1016/j.jse.2009.03.013] [PMID: 19487132] ]. Small tears with no or minimal retraction mostly remain small while large, reparable tears usually increase in size and can rapidly become irreparable with no further increase in pain or disability [3Gerber C, Wirth SH, Farshad M. Treatment options for massive rotator cuff tears. J Shoulder Elbow Surg 2011; 20(2)(Suppl. ): S20-9. [http://dx.doi.org/10.1016/j.jse.2010.11.028] [PMID: 21281919] ]. The prevalence of massive rotator cuff tears has been reported to be between 10 and 40% of the population [4Thès A, Hardy P, Bak K. Decision-making in massive rotator cuff tear. Knee Surg Sports Traumatol Arthrosc 2015; 23(2): 449-59. [http://dx.doi.org/10.1007/s00167-014-3470-y] [PMID: 25502477] ]. For patients failing conservative treatment, presently there are no established guidelines for the management of this injury. This clinical scenario creates a dilemma to the treating orthopedic surgeon as primary repairs of these injuries are associated with poor outcome and high failure rates [5Matthews TJ, Hand GC, Rees JL, Athanasou NA, Carr AJ. Pathology of the torn rotator cuff tendon. Reduction in potential for repair as tear size increases. J Bone Joint Surg Br 2006; 88(4): 489-95. [http://dx.doi.org/10.1302/0301-620X.88B4.16845] [PMID: 16567 784] ]. Tendon transfers and reverse geometry shoulder arthroplasty are the most common surgical procedures carried out for the management of this clinical entity [6Deranlot J, Herisson O, Nourissat G, et al. Arthroscopic Subacromial Spacer Implantation in Patients With Massive Irreparable Rotator Cuff Tears: Clinical and Radiographic Results of 39 Retrospectives Cases. Arthroscopy 2017; 33(9): 1639-44. [http://dx.doi.org/10.1016/j.arthro.2017.03.029] [PMID: 28602388] ]. More recently, reconstruction of the superior capsule has been described as an alternative surgical option [7Mihata T, Lee TQ, Watanabe C, et al. Clinical results of arthroscopic superior capsule reconstruction for irreparable rotator cuff tears. Arthroscopy 2013; 29(3): 459-70. [http://dx.doi.org/10.1016/j.arthro.2012.10.022] [PMID: 23369443] , 8Burkhart SS, Denard PJ, Adams CR, Brady PC, Hartzler RU. Arthroscopic Superior Capsular Reconstruction for Massive Irreparable Rotator Cuff Repair. Arthrosc Tech 2016; 5(6): e1407-18. [http://dx.doi.org/10.1016/j.eats.2016.08.024] [PMID: 28149739] ]. These procedures, however, involve a significant surgical load with accompanying intensive postoperative rehabilitative physiotherapy [9Pogorzelski J, DelVecchio BM, Hussain ZB, Fritz EM, Godin JA, Millett PJ. Superior Capsule Reconstruction for Massive Rotator Cuff Tears - Key Considerations for Rehabilitation. Int J Sports Phys Ther 2017; 12(3): 390-401. [PMID: 28593093] ]. For these reasons, these procedures might not be a viable option for the vast majority of patients, especially for elderly or infirmed patients with poor physiological reserves who might not be able to withstand major surgery and extensive rehabilitation. The introduction of a subacromial spacer, InSpace™ (Ortho-Space, Caesarea, Israel) has provided clinicians with an alternative surgical option for this cohort of patients. The aim of our study is to evaluate the safety and clinical improvement conferred by a subacromial spacer device in the management of irreparable massive rotator cuff tears. We hypothesise that there will be no significant improvement in function, pain post-operatively (p < 0.05). The study started in January 2012 and patients are still being recruited as an ongoing process. Ethics approval was sought from our local research and ethics committee of Medway NHS Foundation Trust prior to the recruitment of patients in the study. All patients with Magnetic Resonance Imaging (MRI) confirmation of a massive rotator cuff tear and failed conservative management were invited to participate in the study. Patients with grade 2 or more severe glenohumeral joint arthritis were excluded from the study. Other exclusion criteria were patients with significant medical co-morbidities precluding general anaesthesia and subscapularis tendon tear which may result in anterior displacement of spacer device post insertion. All insertion of the subacromial balloon device was done arthroscopically by one of the two consultant shoulder surgeons. Procedures were performed under general anaesthetic without any regional block either in the lateral decubitus or the beach chair position. A standard arthroscopic assessment of the shoulder was carried out together with an assessment of the rotator cuff tendon tissue to confirm the diagnosis of an irreparable massive rotator cuff tear. If deemed reparable, the rotator cuff was repaired primarily and the patient was excluded from the study. Prior to insertion, all patients underwent a thorough subacromial bursectomy was performed to clear the subacromial space above the glenoid. The coraco-acromial ligament was preserved and no acromioplasty was performed. If the Long Head of Biceps (LHB) tendon was still present, a tenotomy was performed. No tenodesis procure was carried out. The balloon was then inserted into the subacromial space via the lateral portal and inflated with saline as per the manufacturer's guidelines Fig. (1 ). Majority of patients undergoing this procedure were managed as a day case procedure. Postoperatively, patients were issued with an arm sling for comfort and were advised to wear this for a total of two to four weeks. During this period, they were also advised to avoid shoulder elevation, but were allowed all other passive and assisted activities below shoulder level as pain and comfort allowed. After this period, patients were allowed to return to their normal activity of daily living and no formal rehabilitation input was organized. Surgical wounds were cared for in the community. In the initial part of the study, all the patients were seen by an independent person to assess the functional outcome measures using three validated and commonly used scores. This included the Visual Analogue Score (VAS), Oxford Shoulder Score (OSS) and the Short Form 12 (SF-12) score. Baseline measurement was obtained at the point of entry into the study. Further outcome measurements were obtained at three, six, twelve months post-operatively. After the first year of post-operative follow-up, patients were evaluated on an annual bases using either telephone consultation or postal questionnaire. Outcome measurements collected were statistically analyzed using paired Students-T test. P values were set at 0.05 to reduce type 1 errors. All statistical analysis was carried out using the SPSS version 23.0 (IBM Corp, 2015). Since January 2012, a total of 54 patients satisfied the criteria to be included in this study. However, 28 patients had to be excluded from analysis as only one set of data were collected which did not allow for paired statistical analysis. Reasons behind this include patients who had had less than six months since their index operation and outcome measures with errors or incompletely filled. This did not allow for accurate statistical analysis. The average age of our cohort of the patient at the point of surgery is 67 years old (range 80 to 49). Majority of patients involved in this study were males at a ratio of 19:7. Since we started this study, none of our patient experienced or reported hypersensitivity or inflammatory events following the insertion of the subacromial spacer device. There have been no occurrences of postoperative wound complications either superficial cellulitis or deep joint infection. One patient required a repeat procedure due to recurrence of symptoms within five years with no radiological or arthroscopic evidence of osteoarthritis in the shoulder joint. Of the 26 remaining patients, some of the patients reported outcome measures had to be excluded due to incomplete or erroneously filled responses. The table below summarises the number of completed outcome measures at the various time intervals post-operatively (Table 1, Figs. 2 -5 ). Assessment of pain perception was carried out via the visual analogue score. Using this method of pain assessment, patients reported a significant improvement in the pain as early as six months following insertion of the subacromial device. This improvement in pain continues to be seen throughout our follow up of the patient and was still statistically significant at five years. (Table 2). Similar to the pain outcome measure, patients OSS score also showed improvement six months following insertion of the subacromial device. However, the difference in the first six months was not statistically significant. This improvement continued over the next six months to become statistically significant and remained so up to two years post implantation of the balloon. Our data suggests that the perceived improvement conferred by the device on patients’ functional improvement tailed at the three-year period and continues to deteriorate. At the five-year postoperative period, most patients report being back to their preoperative functional levels. Fig. (3 ). Statistically analyzing the physical component of the SF12 questionnaire showed that patients felt better about their physical self within 6 months of having their operation. Improvement in PCS scores seems to correlate with improvement in OSS scores especially in the first 24 months of implantation. Following that, PCS scores seem to deteriorate in a similar pattern to the OSS. Interestingly, the mental component of the SF12 score does not show any analyzable pattern following implantation of the device. The mean difference of the MCS score was not statistically different at all time intervals apart from the five-year follow-up. At this point, the mean difference was significantly different but may represent an issue with data collection rather than a true difference. (Tables 4, 5). 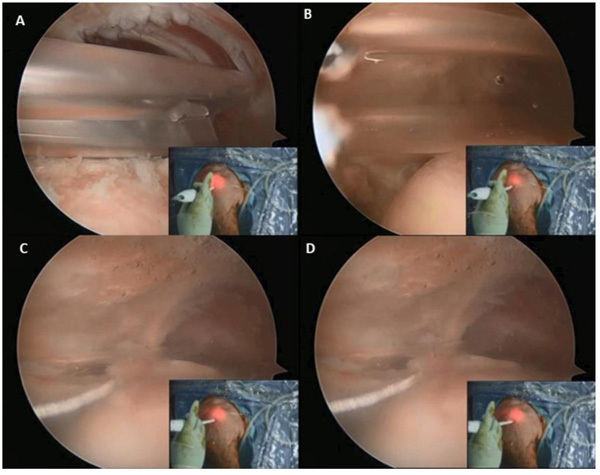 Various stages of arthroscopic implantation of the spacer device: Fig. (1a ) Insertion of the plant in a folder form into the subacromaial space. Fig. (1b ) Start of spreading and inflation with saline solution. Fig. (1c ) Partially inflated spacer positioned over the humeral head. Fig. (1d ). Fully inflated spacer in its final position over the humeral head. Number of patients with completed patient reported outcome measures. 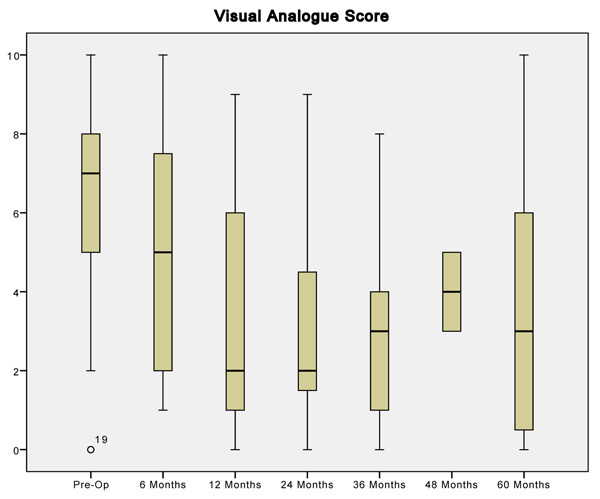 Box and whisker diagram of the visual analogue score results versus time. 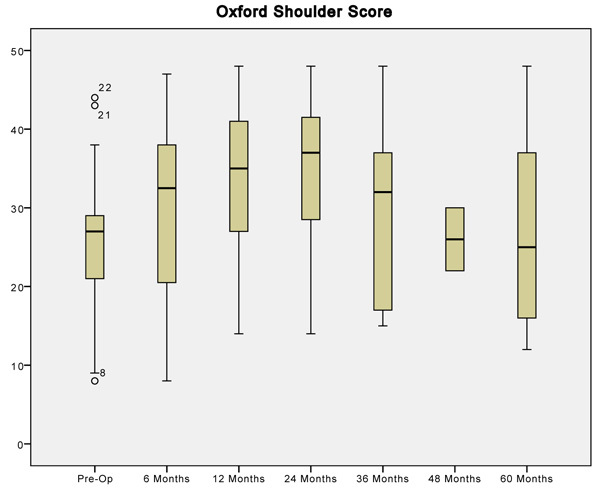 Box and whisker diagram of the Oxford Shoulder Score results versus time. 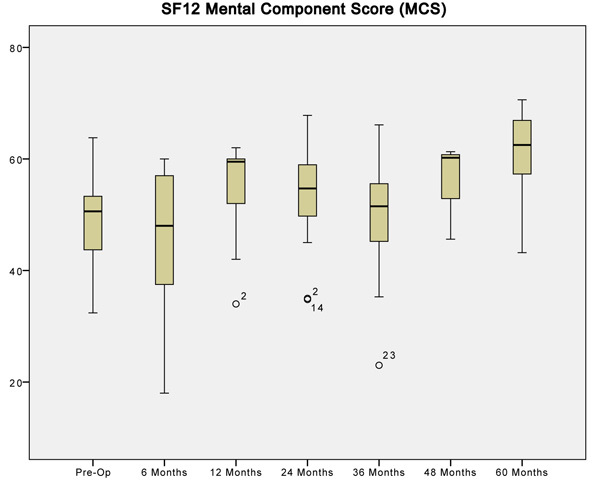 Box and whisker diagram of the SF12 Mental Component Score results versus time. 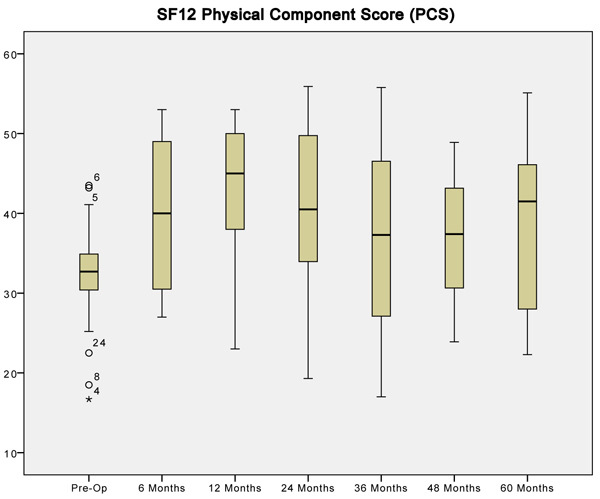 Box and whisker diagram of the SF12 Physical Component Score results versus time. Analysis of Visual Analogue Score using the paired sample T Test. Analysis of Oxford Shoulder Score using the paired sample T Test. Analysis of the PCS component of SF12 using the paired sample T Test. Analysis of the MCS component of SF12 using the paired sample T Test. Surgical management of symptomatic irreparable massive rotator cuff tears of the shoulder has been a difficult clinical entity to manage, especially in elderly patients with significant medical comorbidities. This is reflected by the myriad of available treatment options and their limitations in literature [10Javed M, Robertson A, Evans R. Current concepts in the management of irreparable rotator cuff tears. Br J Hosp Med (Lond) 2017; 78(1): 27-30. [http://dx.doi.org/10.12968/hmed.2017.78.1.27] [PMID: 28067561] , 11Khair MM, Gulotta LV. Treatment of irreparable rotator cuff tears. Curr Rev Musculoskelet Med 2011; 4(4): 208-13. [http://dx.doi.org/10.1007/s12178-011-9098-3] [PMID: 22021014] ]. Whilst we note that intensive rehabilitation input seems to be beneficial according to limited available evidence, the benefit and longevity of the achieved outcomes place significant demand on the available resources [12Collin PG, Gain S, Nguyen Huu F, Lädermann A. Is rehabilitation effective in massive rotator cuff tears? Orthop Traumatol Surg Res 2015; 101(4)(Suppl. ): S203-5. [http://dx.doi.org/10.1016/j.otsr.2015.03.001] [PMID: 25890809] ]. The reverse geometry shoulder arthroplasty has become an increasingly popular option as it provides satisfactory outcomes and pain relief [13Werner CM, Steinmann PA, Gilbart M, Gerber C. Treatment of painful pseudoparesis due to irreparable rotator cuff dysfunction with the Delta III reverse-ball-and-socket total shoulder prosthesis. J Bone Joint Surg Am 2005; 87(7): 1476-86. [PMID: 15995114] , 14Frankle M, Levy JC, Pupello D, et al. The reverse shoulder prosthesis for glenohumeral arthritis associated with severe rotator cuff deficiency. a minimum two-year follow-up study of sixty patients surgical technique. J Bone Joint Surg Am 2006; 88(Suppl. 1 Pt 2): 178-90. [http://dx.doi.org/10.2106/00004623-200609001-00003] [PMID: 16 951091] ]. However, salvage options following a reverse geometry shoulder replacement due to complications or when these replacements come to the end of the life is still an uncharted territory [15Boileau P. Complications and revision of reverse total shoulder arthroplasty. Orthop Traumatol Surg Res 2016; 102(1)(Suppl. ): S33-43. [http://dx.doi.org/10.1016/j.otsr.2015.06.031] [PMID: 26879334] ]. The UK National Joint Registry states a revision rate of 4.2% at 4 years for reverse shoulder replacements done electively [16Registry NJ. National Joint Registry for England and Wales: 14th Annual Report 2017.]. Tendon transfer procedures are a good surgical option for younger and active patients but the intensive rehabilitation coupled with this procedure makes it a less desirable option for the more elderly population of the group. More recently, Mihata described reconstruction of the superior capsule for the management of irreparable rotator cuff tears [7Mihata T, Lee TQ, Watanabe C, et al. Clinical results of arthroscopic superior capsule reconstruction for irreparable rotator cuff tears. Arthroscopy 2013; 29(3): 459-70. [http://dx.doi.org/10.1016/j.arthro.2012.10.022] [PMID: 23369443] ]. Results of this procedure seem encouraging as another option in the armamentarium in managing this shoulder pathology with improvements in American Shoulder and Elbow Score from 23.5 to 92.9. However, like other surgical options that preceded this technique, it involves prolonged anaesthesia, additional donor site morbidity and intensive post-operative rehabilitation protocol [9Pogorzelski J, DelVecchio BM, Hussain ZB, Fritz EM, Godin JA, Millett PJ. Superior Capsule Reconstruction for Massive Rotator Cuff Tears - Key Considerations for Rehabilitation. Int J Sports Phys Ther 2017; 12(3): 390-401. [PMID: 28593093] ]. The result from our study shows that a subacromial spacer device is a viable tool for management of pain in patients with massive rotator cuff tears not amenable to primary repair or prolonged post-operative rehabilitation. Functional improvements of these patient post insertion of these balloon spacers echoes results seen in work done by Deranlot et al. [6Deranlot J, Herisson O, Nourissat G, et al. Arthroscopic Subacromial Spacer Implantation in Patients With Massive Irreparable Rotator Cuff Tears: Clinical and Radiographic Results of 39 Retrospectives Cases. Arthroscopy 2017; 33(9): 1639-44. [http://dx.doi.org/10.1016/j.arthro.2017.03.029] [PMID: 28602388] ] In our study, no other surgical procedures were carried out apart from a bursectomy and tenotomy (if not already absent) of the LHB and insertion of the device. This has the advantage of attributing any functional improvement to the subacromial device alone. Patients in the current study showed progressive functional and pain improvement seen as early as six months post-operatively. Improvement in pain symptoms continues to persist five years following implantation while functional benefits seemed to tail off three years post procedure. The balloon spacer itself is made of poly(L-lactide-co-ε-caprolactone) which is a copolymer of poly-lactide and e-caprolactone [17Savarese E, Romeo R. New solution for massive, irreparable rotator cuff tears: the subacromial “biodegradable spacer”. Arthrosc Tech 2012; 1(1): e69-74. [http://dx.doi.org/10.1016/j.eats.2012.02.002] [PMID: 23766979] ]. In vitro, this material has been shown to degrade over the period of 12 months [18Levy Y, Paz A, Yosef RB, et al. Biodegradable inflatable balloon for reducing radiation adverse effects in prostate cancer. J Biomed Mater Res B Appl Biomater 2009; 91(2): 855-67. [http://dx.doi.org/10.1002/jbm.b.31467] [PMID: 19582846] ]. With this knowledge, it is difficult to explain the phenomenon of sustained improvements in function and pain after a year post insertion. We postulate that this is a result of improved deltoid function secondary to a reduction in pain. Maintenance of the acromiohumeral distance following insertion of the subacromioal device will also help create a more advantageous mechanical environment for the deltoid muscle as its lever arm is restored [6Deranlot J, Herisson O, Nourissat G, et al. Arthroscopic Subacromial Spacer Implantation in Patients With Massive Irreparable Rotator Cuff Tears: Clinical and Radiographic Results of 39 Retrospectives Cases. Arthroscopy 2017; 33(9): 1639-44. [http://dx.doi.org/10.1016/j.arthro.2017.03.029] [PMID: 28602388] ]. In our institution, the average anaesthetic time an arthroscopic evaluation of the shoulder joint and insertion of the spacer device was 38 minutes. The average time taken for device implantation itself is approximately 10 minutes as reported by Gervasi and Senekovic [19Gervasi E, Maman E, Dekel A, Cautero E. Fluoroscopy-guided biodegradable spacer implantation using local anesthesia: safety and efficacy study in patients with massive rotator cuff tears. Musculoskelet Surg 2016; 100(Suppl. 1): 19-24. [http://dx.doi.org/10.1007/s12306-016-0433-0] [PMID: 27900707] , 20Senekovic V, Poberaj B, Kovacic L, et al. The biodegradable spacer as a novel treatment modality for massive rotator cuff tears: a prospective study with 5-year follow-up. Arch Orthop Trauma Surg 2017; 137(1): 95-103. [http://dx.doi.org/10.1007/s00402-016-2603-9] [PMID: 27957596] ]. This reflects the simplicity of this procedure and the reduced surgical and anaesthetic load on the patient. This may have a huge bearing on patients not able to withstand prolonged anaesthesia. We also note a case series in literature describing insertion of this subacromial implant under local anaesthesia under image intensifier guidance [19Gervasi E, Maman E, Dekel A, Cautero E. Fluoroscopy-guided biodegradable spacer implantation using local anesthesia: safety and efficacy study in patients with massive rotator cuff tears. Musculoskelet Surg 2016; 100(Suppl. 1): 19-24. [http://dx.doi.org/10.1007/s12306-016-0433-0] [PMID: 27900707] ]. This will undoubtedly further extend the indications of this implant to patients who are not medically fit for surgery under general anesthesia. In terms of safety, we did not note any complications directly related to the surgery for implantation of this device or any allergic reaction to the material itself. In our cohort of patients, only three out of 54 (5.6%) went on to have a reverse geometry shoulder replacement for ongoing debilitating symptoms not relieved by the balloon spacer device. The average interval between insertion of balloon to receiving a shoulder replacement in these patients was 14 months. This finding identifies the subacromial device has the potential to delay the need for arthroplasty for patients with symptoms secondary to an irreparable cuff tear. This option may be beneficial to allow patients to be optimized both medically and surgically before arthroplasty surgery is performed. The main limitation of our study is the lack of a control group. We could not ethically justify not treating patients with this condition and not offering them a surgical treatment. The second limitation is the small number of patients who had completed five years follow-up. Although 54 patients have undergone balloon interpositional arthroplasty in our institution over the last six years, several patients were lost to follow-up, while a large portion of patients have not completed the required period of follow-up to allow statistical analysis, and therefore excluded from analysis. Despite this, to the best of our knowledge, this study is the largest prospective study with follow-up period of at least five years looking at the effectiveness of this device in the management of irreparable rotator cuff tear. Based on the findings from our study, we found balloon interposition arthroplasty to be a safe and useful option in the management of irreparable massive rotator cuff tears. Sustained functional improvement up to and after 36 months, reduced surgical burden and minimal post-operative rehabilitation are the main advantages identified by our study. Improvement in function and symptoms from this procedure may negate or delay the need for a more substantial procedure such as a reverse geometry shoulder replacement. However, a randomized control trial will be required to substantiate the findings of this study and remove any bias related to our prospective cohort study. Ethical approval was granted by the Medway NHS Foundation Trust clinical effectiveness department. Approval number 1718N.0068, UC. Written informed consent for publication has been obtained. We would like to acknowledge Mr. Vellala Prasad in coming up with the study design. Mr. Nik Bakti, Mahendar Bhat, Abhinav Gulihar assisted Mr. Vellala Prasad in data collection. Nik Bakti, Abhinav Gulihar and Bijayendra Singh contributed to the write up of the article. Registry NJ. National Joint Registry for England and Wales: 14th Annual Report 2017.